The City of Vancouver is looking at the idea of adding more bike and pedestrian lanes to the Cambie and Granville Street Bridges. As a first step the city has posted a request for proposals and is seeking to hire a firm to study the options by October so that councillors will have a better sense of how feasible the ideas are before they begin public consultations. Any proposal to reduce car lanes on the bridges is bound to be controversial, given the controversy surrounding theBurrard Bridge bike lanes and the Hornby and Dusmuir street bike lanes downtown. But the council insists the bridge study is the only the beginning of a very long process and no final decisions have been made. The proposal for the Granville Bridge involves replacing the two centre lanes with a raised walkway that would be shared by pedestrians and cyclists. The shared pathway would start around 8th Ave and a drawing depicts it as a tree-lined promenade. 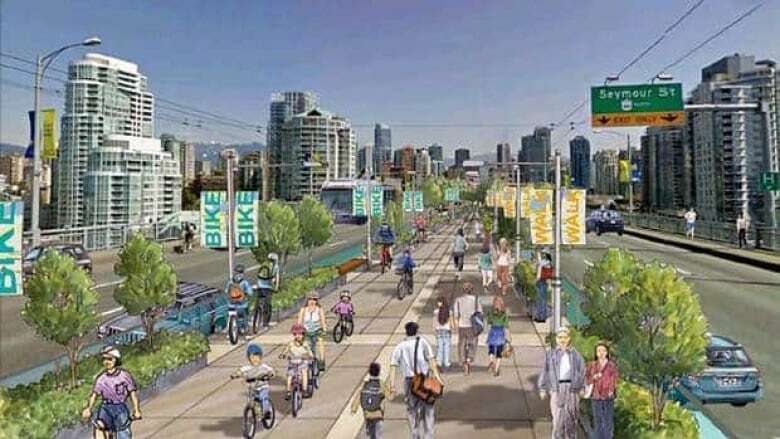 The proposal for the Cambie Bridge involves turning one of the three lanes exiting downtown into a bike lane as far as the 2nd Avenue off ramp, then widening the bridge along the off ramp to create a shared bike and pedestrian lane for the rest of the distance. Both bridges currently have sidewalks for pedestrians on both sides, but the only way bikes are allowed to cross the Granville Street Bridge is to ride in the traffic. On the Cambie Bridge bikes share the sidewalk on the eastern side with pedestrians, but are not allowed on the narrower sidewalk on the west side. The idea for the new lanes was first proposed in the city's 2040 transportation plan, which aims to have at least two-thirds of all trips downtown on foot, bike or transit by 2040.